Hard to believe it's a new year. Everything is new. I haven't resolved to do anything yet...I might as well wait a few days. That's all I can resolve for now. 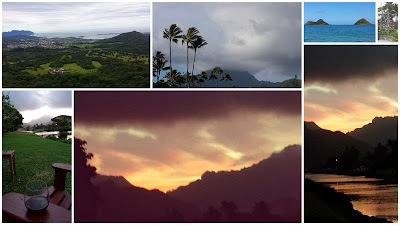 And now for a few pictures of Oahu. Last week I mentioned that the big thing to do in Oahu (at least when you live in Maui) is to go shopping. But I didn't go shopping. * Instead I sat on the canal, drank wine, went to the beach, and went to Island Snow for shave ice (the same place the Obamas go...we're cool like that). *I lied. I bought a housewarming gift. And I received the "Journal of Awesome" from my friend. I also bought coffee, pastry and musubi. Alright you overachiever (yes you). Did you make a resolution? Have you broken it yet?